In this lesson, we will learn how to write an algebraic expression representing a situation and interpret different statements using addition and subtraction operations. Write an expression for a number 𝑦 increased by 12. 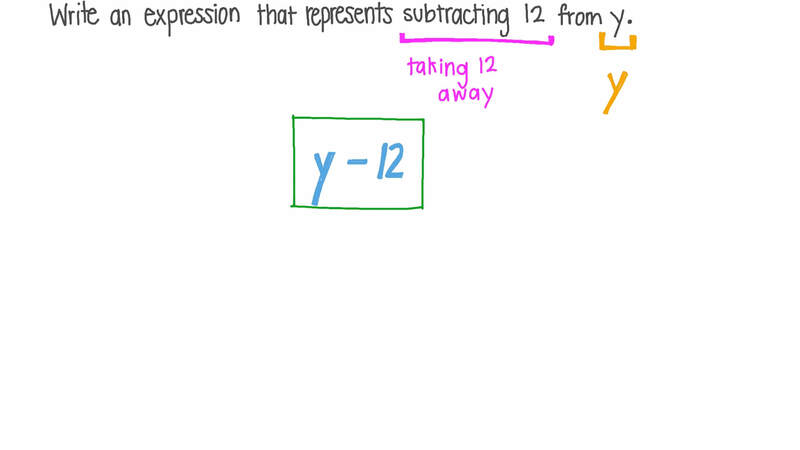 Write an expression that represents subtracting 12 from 𝑦 . Evaluate 𝑦 − 4 , given that 𝑦 = 9 . Dina read a novel for minutes on Tuesday, for the same duration on Thursday, and for 20 minutes on Saturday. Write an expression in the simplest form that represents the total number of minutes she spent reading. Sarah is years old, and her sibling is 9 years younger. 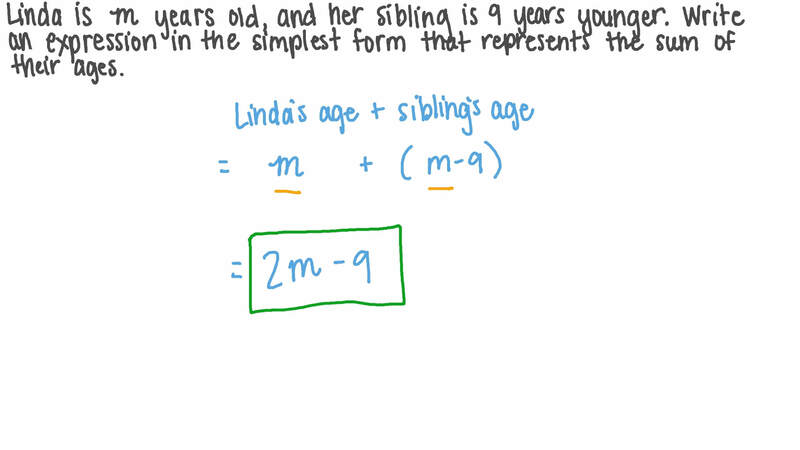 Write an expression in the simplest form that represents the sum of their ages. The sum of two numbers is 8. Given that one of them is 𝑥 , write an expression in terms of 𝑥 for the other one. Which of the following expressions represents subtracting 𝑦 from 5? Which of the following expressions was used to fill the values in the table below? In the diagram at the top, the number represented by the blue box is 𝑎 + 𝑏 − 𝑐 . Find the expression in terms of 𝑎 , 𝑏 , and 𝑐 for 𝐼 , 𝐼 𝐼 , and 𝐼 𝐼 𝐼 as described by the diagrams. The current ages of two people are 𝑦 and 𝑐 . What was the sum of their ages 7 years ago? Sarah has 11 LE. If Mona has 𝑥 L E less than Sarah, how much does she have? Write an expression that represents the length of 𝐴 𝐵 in the given figure. The table shows the total medal counts for different countries in the 2006 Winter Olympics. Find an expression that represents the total number of medals earned by all the countries listed in the table. Given two successive odd numbers, where the smaller one is 𝑐 + 9 , write an expression for the larger one. In a two-digit number, the units digit is 𝑝 , and the tens digit is 𝑞 . Write an expression in terms of 𝑝 and 𝑞 for the value of the two-digit number. If the area of each shape is given by the expression written inside it, write an expression for the sum of their areas. If Yasmine saved 𝑥 L E and her father gave her 5 LE, how much money does she have in total?